Macao (Macao SAR) – May 30, 2018 (travelindex.com) – The Global Tourism Economy Forum (GTEF or the Forum) kicked off the China roadshow to promote its seventh edition at ITB China at the Shanghai World Expo Exhibition & Convention Center on May 16, 17 and 18. 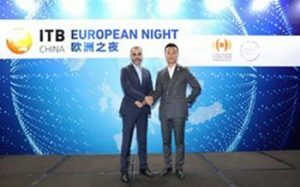 As an official partner of the 2018 EU-China Tourism Year (“ECTY2018”), GTEF sponsored and co-organized the ITB China European Night with one of its prestigious supporting units, European Travel Commission (ETC), to introduce GTEF 2018 and facilitate exchanges between Chinese and European tourism stakeholders. At the European Night reception held at Mandarin Oriental Shanghai, Mr. David Axiotis, General Manager of ITB China, delivered a welcome remark; Mr. Eduardo Santander, Executive Director and Chief Executive Officer of ETC, shared information about ECTY2018 events that had already taken place and exciting activities that are yet to come; and Mr. Jason Wang, Chief Operating Officer of GTEF, introduced GTEF 2018’s theme and presented the Forum’s business matching offerings. Among the attendees of the reception were Mr. Kristjan Staničić, Managing Director of Croatian National Tourist Board; representatives of Malta Tourism Authority, Turismo de Portugal, Slovenian Tourist Board and Visit Brussels. The reception successfully achieved the objective of familiarizing the Chinese and European tourism stakeholders’ understanding of GTEF’s role as a tourism exchange and cooperation platform. During the trade fair, Mr. Jason Wang exchanged views with tourism representatives of EU member state, including Mr. Filipe Silva, Board of Director of Turismo de Portugal; Mr. Igor Paule, Chief State Advisor of Ministry of Transport and Construction of Slovakia; Ms. Olga Gončarova, Head of Incoming Tourism Subdivision of Lithuanian State Department of Tourism; Ms. Inguna Zigure, Senior Expert of Investment and Development Agency of Latvia; Ms. Kiti Häkkinen, Manager of Regional Partnerships of Visit Finland; Ms. Monica Wu, Manager of Malta Tourism Authority; Ms. Teresa Chen, Marketing Representative of Catalan Tourist Board; Ms. Liu Jing, B2B Industry Manager of Austrian National Tourist Office; and Ms. Saša Verovšek Musič, Project Manager of Sales and Promotion Department of Slovenian Tourist Board. He also met a number of leading Chinese tourism enterprises and organizations to explore collaboration possibilities. GTEF 2018 is scheduled to be held at MGM COTAI on October 22 and 24, under the theme “Strategic Partnership in a New Era, Rising Momentum for a Shared Future”. Presenting EU as the Partner Region and Guangdong Province as the Featured Chinese Province, GTEF 2018 will explore how the EU, the second-most popular destination for outbound Chinese tourists outside Asia, and the Greater Bay Area in Guangdong Province, soon-to-be the seventh largest economic bloc in the world, can use their collective effort to create a new catalyst for global economy. GTEF will also offer tourism promotion, investment and cooperation opportunities through bilateral trade meetings, business matching, networking, workshops, exhibitions, etc. The Global Tourism Economy Forum (GTEF) is hosted by the Secretariat for Social Affairs and Culture of the Macao SAR Government, co-organized by the China Chamber of Tourism under the authorization of All-China Federation of Industry and Commerce (ACFIC), and coordinated by GTERC in collaboration with UNWTO. GTEF’s supporting units include the Former China National Tourism Administration, the Liaison Office of the Central People’s Government in the Macao SAR, Office of the Commissioner of the Ministry of Foreign Affairs of the People’s Republic of China in the Macao SAR, World Travel and Tourism Council (WTTC), Pacific Asia Travel Association (PATA), World Tourism Cities Federation (WTCF), European Travel Commission (ETC) and Macao Government Tourism Office (MGTO).